This year’s Commencement ceremonies will take place on Sunday, May 3. All degree candidates must apply for graduation through WebAdvisor by Saturday, February 28. Despite colder temperatures and snow arriving on campus in recent days, it’s actually the perfect time for many students to think of spring—and graduation! 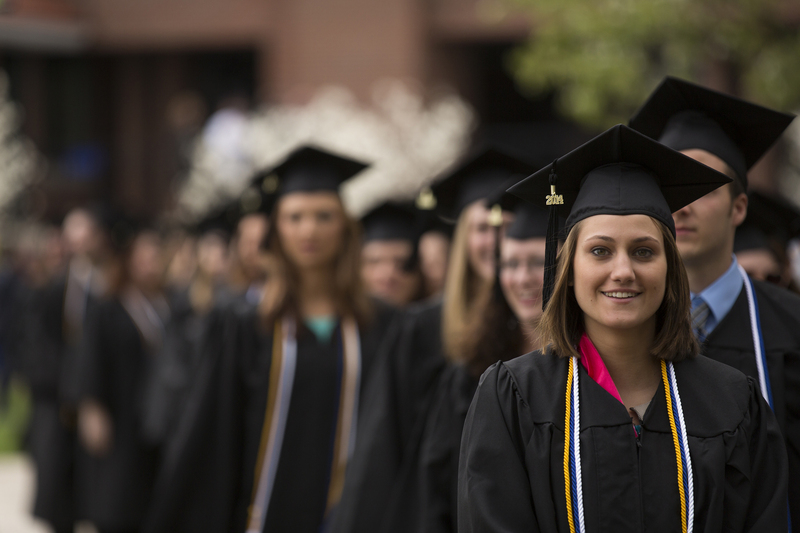 More than 1,000 undergraduate and graduate students are expected to participate in Commencement ceremonies on Sunday, May 3, 2015, on the University Quadrangle. The graduate ceremony will take place at 10:00 a.m. and the undergraduate ceremony is scheduled for 2:00 p.m. In preparation for Commencement, all degree candidates must file the WebAdvisor graduation application. The deadline for applying and ordering caps and gowns online is Saturday, February 28, 2015. Tickets will be sent to students’ permanent homes in March. Students and their families are invited to visit aurora.edu/commencement for information about graduation. Graduates who do not plan to participate in the Commencement ceremony must still submit the application for graduation and pay the appropriate fee by Saturday, February 28, 2015. Diplomas will be mailed only to those who have completed the graduation application and paid the fee.